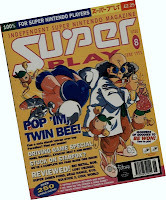 I grew up a Japanophile, I blame SuperPlay magazine. Every issue with its Will Overton cover art screamed everything Japanese. Its pages were equally divided between western released games, Japanese imports, anime films and even accounts of Japanese life. In those 1990’s days the land of the rising sun was a land I had never really heard about before. It was alien to me, so different, so appealing and to honest so outright weird. 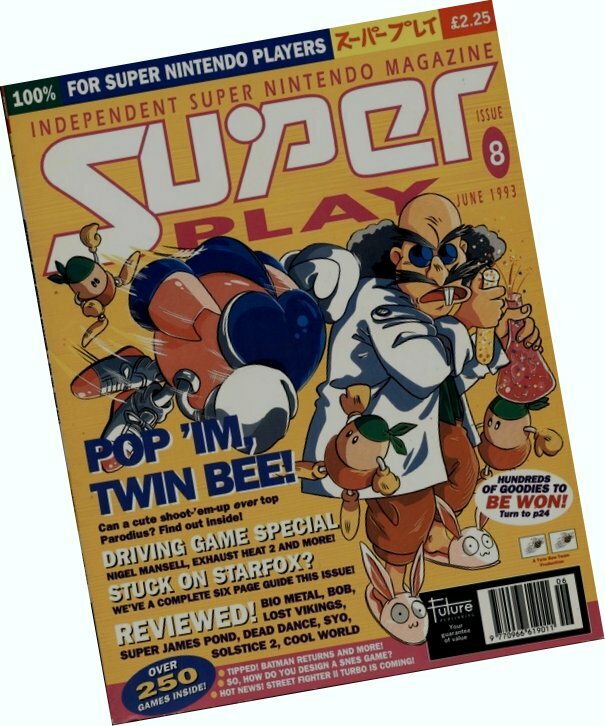 Pop N’ Twinbee to me epitomises all of that. It’s the second in series of anime style vertical shooting games which had proved massively popular in Japan. 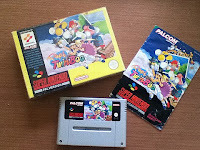 So popular in fact that the original TwinBee for the Famicom was at the time one of the best-selling Konami games, on any system, of any genre. However despite its eastern popularity the game was elusive in the west. Translated SNES sequels failed to reach American shores, finding only a limited release in Europe. In a time of no internet, when the idea of Tesco selling games was laughable, the niche and obscure were never games I was going to own, even if I wanted to. So I have actually only ever played Pop N’ Twinbee on emulation. It is not without nostalgia though, as one complete play through was when I actually fulfilled the Japanophile’s dream and went to Otaku Land. It felt only apt that on the bullet train from Osaka to Tokyo I played a game that to me was quintessentially Japanese. That was just 5 years ago, so it’s less a case of opinion being coloured by nostalgia, more like catching up with an old friend. An old friend who seems to be rambling in a nonsensical way. It’s not often that a world, in this case Donburi Island, is plunged into peril when a benevolent scientist hits his head. The concussed Dr. Mardock now inexplicably wants to control the world with an army of Acorn Men and only TwinBee and WinBee can stop him. I fear certain aspects of this epic tale of good against evil may have been lost in translation. What plot remains however is at least bonkers and suitably endearing. An unusually two player shooter, that looks colourful, bright and provides a challenge for those unaccustomed to memorising attack patterns. 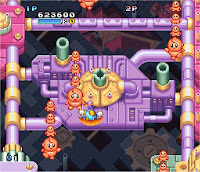 Pop N’ TwinBee is not then a bullet hell shooter but it does veer towards difficult at times. This is particularly apparent on later difficulty setting playing one player, when careless mistakes or lapses in concentration send you right back to the start of a level. This frustration is exacerbated by the fact you can go from full life to death in a matter of seconds, often caused by the player being positioned in a corner of a screen, or struck by an enemy as it enters the field of play. sufficiently quirky to make me smile. On your always upward quest you are as likely to meet giant mechanized versions of your character (consumer with hatred and no doubt some sort of insatiable thirst for vengeance) as you are babies, parachuting pandas or happy go lucky personified pineapples, merrily going about their day to day business with a spring in the step while humming a jolly tune. It’s probably best to avoid the irony that slaughtering the latter gives you the best rewards- even though they are the very innocent citizens that you are trying to save from oppression. The game is littered with adorable touches that you only notice on repeated plays. The ‘Acorn Men’ minions of Dr. Mardock particularly are worth keeping an eye on. At times the can be seen swabbing the decks of airship galleons and even grabbing fire extinguishers to valiantly try to put out the fires on the end of level bosses. It’s such a shame they’re fighting on the wrong side of this classic struggle against oppression – they are such a dependable work force you can only imagine how helpful their skills and efforts could be if used for good. This level of intricate detail is testament to the fact that Pop N TwinBee is a beautiful game. I would even go so far as to say that were it made for a contemporary audience, it could look no better. The charm is in the pixels, the colours, the parallax scrolling. 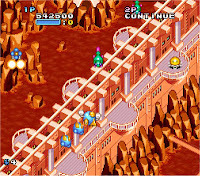 Full of life backgrounds that never distract the player as the more vibrant colours are reserved for the player’s sprite, and that of the enemy. Theses backgrounds are instead is made up of pastel shades making Donburi Island look like a rich whimsical water painting. If anything it’s a shame it all goes by so quickly and un-noticed, with the players’ eyes (naturally) on avoiding projectiles and grabbing bonuses. Sadly though, it’s not just those detailed environments that whizz past too quickly – the whole experience can be over in an hour. And just to end the experience with a suitable eyebrow raising moment – the end credits seem to parody the intro to the classic Ghibli film ‘My Neighbour Totoro’ – have a look on YouTube to see what I mean! But what am I left with after that fleeting hour of furious button bashing and an onslaught of colour and randomness? A medley of quirky tunes that remain eternally etched on my brain and a go-to game be it for 15 minutes, an hour, or continuous play. 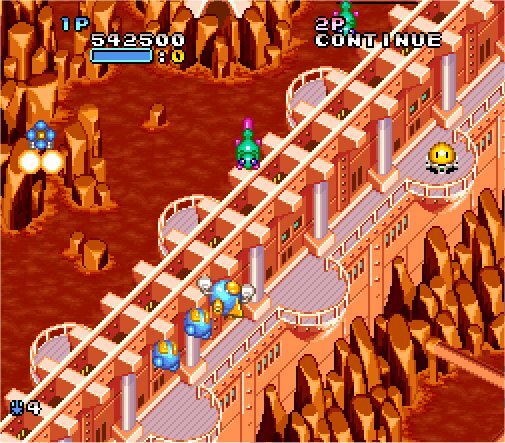 In short Pop N’ TwinBee is an excellent original and often hilarious vertical shooter that oozes quality and charm in equal amounts. Quirkiness is indeed appreciated and addictive. How did I acquire it? In reality this game should be Game 000. When I started out on collecting SNES games I didn’t need to buy the console, I already owned two and they had sat in my loft for years. 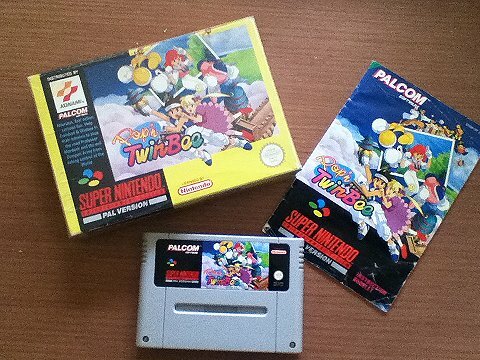 I thought I had no games for the, however when I went to get the Super Nintendo(s) there Pop N Twinbee was, boxed and complete. The box itself is a little tatty, the instructions crinkled and damaged by a damp attic but that if anything adds to the charm. I know I didn’t but it on eBay, so I can only guess that I saw it in at a boot fare or charity shop one day and bought it without ever playing it. 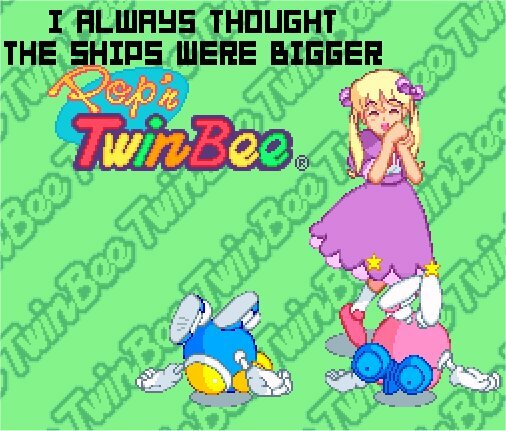 I do know I once introduced my (now) wife (then girlfriend) to Pop N Twinbee via emulation, and we played through it together a number of times maybe 10 years ago. Perhaps I got it then to show her what the cartridges used to look like or something equally sweet and sickening. It may not be mint, but it is mine!